Ventilation is a key consideration especially when growing indoors under artificial lighting. The combination of lighting and plants generates excessive amounts of heat and humidity which will harm plants if not properly controlled. 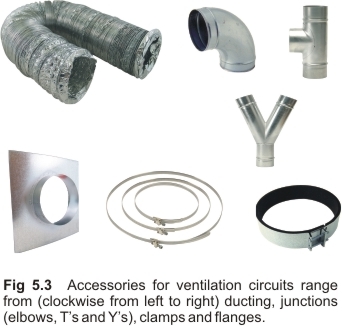 To view a basic layout of ventilation equipment see Fig 5.4 & 5.5 below. ● Configuration of ducting (diameter, length, junctions and bends). ● Inlet and outlet filters. ● The maximum temperature of incoming air. ● Total wattage of all electrical devices in the grow room. 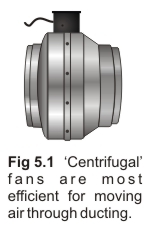 Where air is being moved through ducting, centrifugal/ radial (or ‘mixed inline’) fans are the most efficient (Fig 5.1). These are generally more effective at pushing air through ducting, as opposed to pulling air. Therefore, especially for long sections of ducting, position the fan at the inlet end, not the outlet (Fig 5.5). To prevent condensate from pooling in the fan, have it mounted vertically in the ceiling as opposed to high on a wall (Fig 5.4). This is used for pushing air into the room and helps to maximize the effectiveness and lifespan of the exhaust fan. To ensure the exhaust fan’s output is not wasted, use an inlet fan of equivalent airflow capacity. With the aid of ducting, you can choose where the incoming air comes from. For example, in hot weather it would be better to draw air from an air-conditioned room instead of from outdoors. However, either way, be careful that the inlet air is fresh and not sourced from the same area where the exhaust air is dumped. Where the incoming air enters the room, do not have it blowing directly onto plants, especially if its temperature is extreme. This problem can be overcome by spreading the air at the outlet point by using a ‘Y’ or ‘T’ piece (Fig 5.3 & 5.5), or a length of ducting with several holes placed in it. Additional mixing can be achieved with the aid of an oscillating fan. A passive vent is a cheaper but less effective alternative to an inlet fan. To help maximize the exhaust fan’s output, the size of the vent’s surface area must be at least double that of the outlet on the exhaust fan. For maximum fan efficiency keep ducting as short and straight as possible. Where junctions are needed employ ‘Y’ junctions instead of ‘T’s. If the diameter of ducting needs to change en-route, ensure this change is gradual (~10 degrees if possible). Usually operates 24 hours a day to ensure air is always distributed evenly, but ‘gently’, throughout the room (Fig 5.4 & 5.5). This eliminates ‘hot spots’ i.e. zones prone to CO2 depletion or excessive humidity and temperature that are most likely to occur nearest lights and dense foliage. Ensure the fan is blowing air across the top of the canopy that is located immediately below the lamp. Additional fans may be required where multiple lamps are being used. 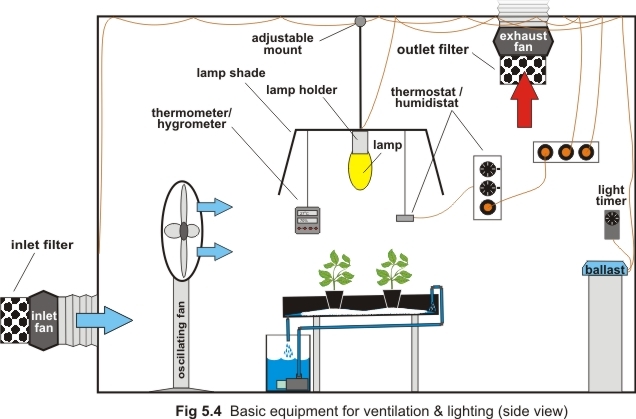 This requirement can be determined by obtaining temperature and humidity readings beneath each lamp (see below). Position the probe in the place of highest temperature or humidity. This is typically directly beneath the lights and amongst the foliage. Where multiple lamps are being used it is best to have a dedicated meter for each lamp. Never assume that the ventilation system will work uniformly throughout the room. Having multiple meters also helps to cross check that the others are working accurately. ● Allocate sufficient clearance around the plants for maintenance. ● Position plants at a convenient working height. ● It is beneficial to have a minimum gap of 1 meter (3 ft) between the lamp shade and the ceiling. Because hot air rises, this space helps shift the maximum temperature further from the plants. As a general rule, try to keep the air moving in one direction as this creates and maintains air momentum. The ideal configuration depends on many factors including room size and shape, and the relative placement of equipment and plants within the room. 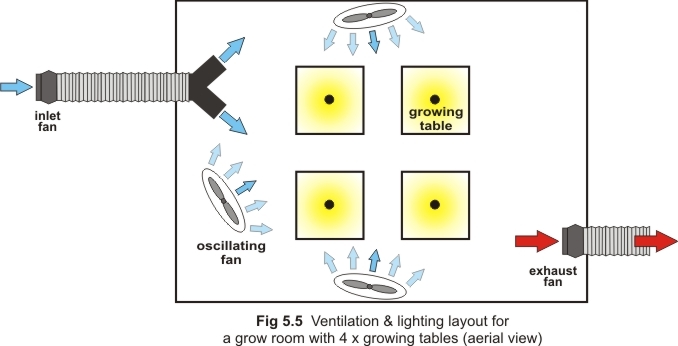 As a general rule, locate the ‘inlet’ and ‘exhaust’ at opposite ends of the room, with an oscillating fan maintaining the general airflow direction provided by the inlet (Fig 5.5). For wider rooms especially, employ multiple inlets and exhausts, and space them evenly across the width of the room. This will help ensure all air is replaced. Routinely check temperature and humidity at various points throughout the room to verify that the system is working effectively. For best airflow, keep objects at least 1 meter (3 ft) away from the fan inlet. “Automated” fan switch: Thermostats and humidistats are useful for activating both the inlet and the exhaust fan (Fig 5.7). Position the thermostat’s sensor at the hottest point in the foliage, and the humidistat’s sensor at the most humid point. Determine these points using a thermometer and hygrometer. For “day time” (lights-on) they should be set to activate the fans when either the temperature exceeds ~27oC (80oF), or the humidity exceeds 70% RH. At “night time”, the temperature should be allowed to drop below 20oC (68oF), but no further than 15oC (59oF). To achieve this, you will need a controller that allows separate settings for both day and night. Alternatively, install a separate, dedicated set of fans for both day and night. An ‘axial’ fan in the ceiling (controlled with or without a timer) may be sufficient to produce the correct night time conditions. “Manual” fan switch: Control gear such as thermostats, are often not essential in extremely hot or humid climates because it is usually necessary to have fans running constantly anyway. However, the above mentioned temperature and humidity targets still apply. A modest degree of control can be gained using a timer - a surprisingly effective aid especially if the weather is consistent or predictable. We strongly suggest speaking to your local growshop when designing your ventilation system. A system which is perfect for one particular climate may be useless in another. 1. Shift the ‘lights on’ period to night. 2. Air-condition the incoming air. 3. Reduce the amount of lighting and/or plants. 4. Employ lights or shades that are air cooled (Fig 4.5). 5. Where the “hot days” are infrequent and the ventilation system is otherwise satisfactory, turn some (or all) lights off during those hot days. 6. Relocate the grow room to a cooler area. For example, a shaded part of the building or that part most exposed to the prevailing wind. 7. Use insulation in the surrounding rooms so they do not amplify the temperature of the grow room. If the temperature is too low, consider pre-heating the incoming air. If air is coming directly from outside, bring it from a warmer room. If incoming air is not heated you may be restricted as to how frequently fans are operated, especially at night when lights are off. A fan speed controller is a useful addition where the fan's flow rate is too high during the colder or less humid months (Fig 5.8).